Food odors can have a strong impact on your appetite. Some food odors will prevent you from overeating and and getting fat. A new study finds this can be a novel way to fight cravings for unhealthy foods and prevent you from getting obese. In recent years, ambient odors have become an important tool that businesses use to attract customers and influence their behavior. For example, food companies and restaurants, use the smell of delicious food to tempt people into their establishments. The authors of the current study wanted to understand, in more detail, how food-related ambient scents can affect your food choices. In particular, they focused on how these aromas influence your selection of healthful vs. unhealthful foods. Researchers at the University of South Florida ran a series of experiments in which people were exposed to the scent of either a healthful food, such as an apple, or an unhealthful food, such as pizza. 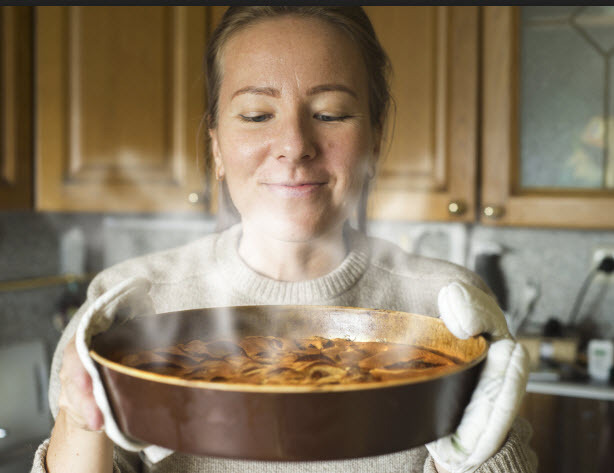 Surprisingly, however, individuals exposed to the aroma of an unhealthful food for 2 minutes or longer were more likely to make a healthful food choice. The first experiment took place at a school cafeteria used by 900 children. In each day of the three day study, students were exposed to one of three conditions: a control condition with no scent, a pizza aroma, or an aroma of apples. Odors were distributed through nebulizers placed near the students as they waited online food. All students were exposed to the smell for approximately two minutes. For the apple aroma; 37% of the food items sold were unhealthy. On the control day, 36% of the items sold were unhealthy. No statistical difference. But on pizza day, only 21% of the students bought unhealthy snacks. In Phase 2 of this study, participants sat in a room with one aroma of an unhealthy food for at least 2 minutes. Researchers then placed plates of strawberries and cookies in front of them and asked which food they would choose. Once again, those exposed to the aroma of the unhealthy food chose the health food option. In Phase 3, some participants were exposed either to a cookie or a strawberry aroma for less than 2 minutes. Other volunteers were exposed for longer than 2 minutes. Results showed that those who smelled cookies for more than 2 minutes were likelier to choose a health food. And those who had smelled cookies for under 2 minutes were more likely to chose the unhealthy food. Timing is crucial.